His remarks on J&K were seen in context of article 370 and 35A though he didn’t mention the articles by name. Bhagwat touched on several subjects, including the economy, saying farmers and the informal sector needed attention. NAGPUR: There is need for constitutional amendments with regards to J&K, RSS chief Mohan Bhagwat said in his Dussehra address on Saturday. National security should be paramount in dealing with the Rohingya issue as they were driven out of Myanmar due to violent and criminal activities, he added. Bhagwat touched on several subjects, including the economy, saying farmers and the informal sector needed attention, adding there was need to shed old "isms" and factor in ground realities. His remarks - the condition of those living in a wretched state as refugees because of their decision to be in India and remain Hindu should be addressed — on J&K were seen in the context of articles 370 and 35A (dealing with re sidency rights) though he didn't mention them by name. "Necessary constitutional amendments will have to be made and old provisions will have to be changed in that state. Only when the constitutional amendments are done, can the residents of J&K be completely assimilated with the rest of India," he said. RSS chief Mohan Bhagwat echoed the Centre's stand against considering Rohingya as refugees, saying, "We have been facing the problem of illegal Bangladeshi migrants and now Rohingya have infiltrated our country." In his Dussehra address, he said, "They (Rohingya) are being driven out of Myanmar mainly due to their continuous violent and criminal separatist activities and links with terrorist groups. Any decision should be taken keeping in mind that they will definitely be a threat to national security and integrity". In an apparent reference to reforms such as GST, Bhagwat said while some tremors and instability were expected while reforming and cleaning the economy, the "informal economy" should receive the most support. He also said loan waivers were temporary solutions. "Our Niti Aayog and economic advisers to the states will have to come out of the same old 'isms' to integrate ground realities," the RSS chief said. Backing measures like farm insurance and soil cards, Bhagwat indicated that the Modi government should be mindful of the stress caused to the poor and farmers. "Our farmer, who feeds not just his family but the entire nation, is in pain today. He is depressed after facing the onslaught of floods and droughts, export-import policy, meagre pricing, mounting loans and losing everything once the crop is ruined." 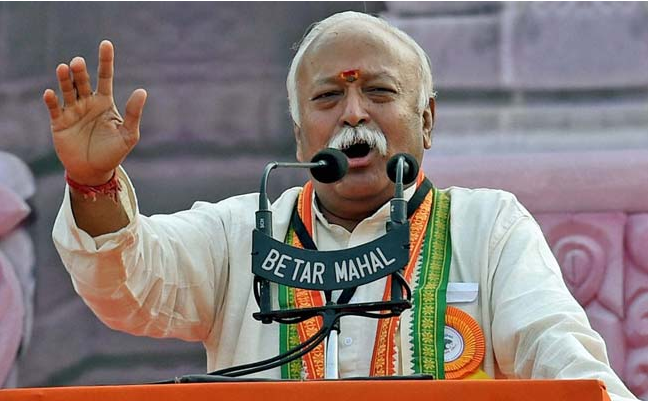 On cow vigilantism, Bhagwat reiterated his earlier comments that it is reprehensible that some persons have been killed allegedly by gaurakshaks but added that many people have been killed by cow smugglers. He said it is unfair to link cow protection with violence or communal feelings. He said words in the Supreme Court ruling on vigilantism were twisted to misinterpret it. "The legal virtuous work of cow-protection will continue and increase in coming days," he declared. It was one of the original demands of Jan Singh and Shyama Prasad Mukherjee. It can happen only when BJP and other parties who support this have 2/3rdmajority. Put 1 crore Biharis and the problem will be solved. China is doing the same to Tibet. Simple and straightforward answer... yes. learn from Ori pai. You need not a glass but 720 ml of cheap whisky.